A team of researchers at the University of Illinois at Chicago describe a new method for precisely measuring the behavior and temperature of new two-dimensional (2D) materials that will enable engineers to build smaller and faster microprocessors. Their findings have been published in the journal Physical Review Letters. Recently developed 2D materials, such as graphene - which has a single layer of carbon atoms - have the potential to substitute traditional microprocessing chips based on silicon, which have reached the boundary of how small they can get. But engineers have been hindered by the inability to measure how temperature will impact these new materials, collectively known as transition metal dichalcogenides, or TMDs. Using scanning transmission electron microscopy integrated with spectroscopy, researchers at UIC were able to measure the temperature of numerous 2D materials at the atomic level, paving the way for considerably smaller and faster microprocessors. They were also able to apply their method to measure how the 2D materials would expand upon heating. Microprocessing chips in computers and other electronics get very hot, and we need to be able to measure not only how hot they can get, but how much the material will expand when heated. Knowing how a material will expand is important because if a material expands too much, connections with other materials, such as metal wires, can break and the chip is useless. Traditional ways to measure temperature do not work on minute flakes of 2D materials that would be used in microprocessors, as they are just too small. Optical temperature measurements, which employ a reflected laser light to measure temperature, can’t be used on TMD chips as they don’t have sufficient surface area to house the laser beam. 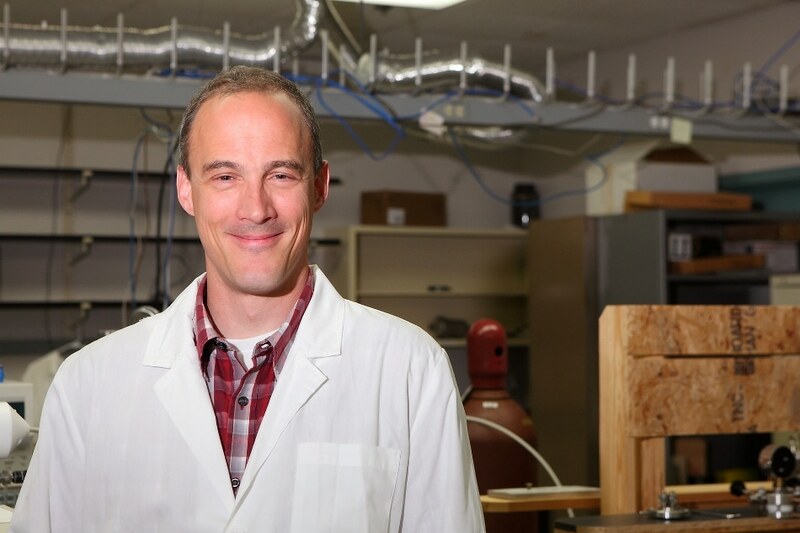 Klie and his colleagues came up with a method to take temperature measurements of TMDs at the atomic level using scanning transition electron microscopy, which uses a beam of electrons conveyed through a specimen to develop an image. “Using this technique, we can zero in on and measure the vibration of atoms and electrons, which is essentially the temperature of a single atom in a two-dimensional material,” said Klie. Temperature is a measure of the average kinetic energy of the random motions of the particles, or atoms that constitute a material. As a material gets hotter, the frequency of the atomic vibration becomes higher. At absolute zero, the lowest theoretical temperature, all atomic motion stops. Klie and his colleagues heated microscopic “flakes” of various TMDs within the chamber of a scanning transmission electron microscope to different temperatures and then aimed the microscope’s electron beam at the material. Using a method called electron energy-loss spectroscopy; they could measure the scattering of electrons off the 2D materials caused by the electron beam. The scattering patterns were entered into a computer model that translated them into measurements of the vibrations of the atoms in the material – simply put, the temperature of the material at the atomic level. The method can also be used to forecast how much materials expansion will occur when heated and how much contraction when cooled, which will help engineers construct chips that are less susceptible to breaking at points where one material touches another, such as when a 2D material chip makes contact with a wire. No other method can measure this effect at the spatial resolution we report. This will allow engineers to design devices that can manage temperature changes between two different materials at the nano-scale level. Xuan Hu, Poya Yasaei, Jacob Jokisaari, Serdar Ogut and Amin Salehi-Khojin of the University of Illinois at Chicago, are the paper’s co-authors. This study was supported by EFRI 2-DARE grant 1542864 from the National Science Foundation.